A Day Of Triumph In A Time Of Change: Cuba's High Holiday Explained It's been 62 years since Fidel Castro launched the attack that began the Cuban revolution, and the country still marks the date. 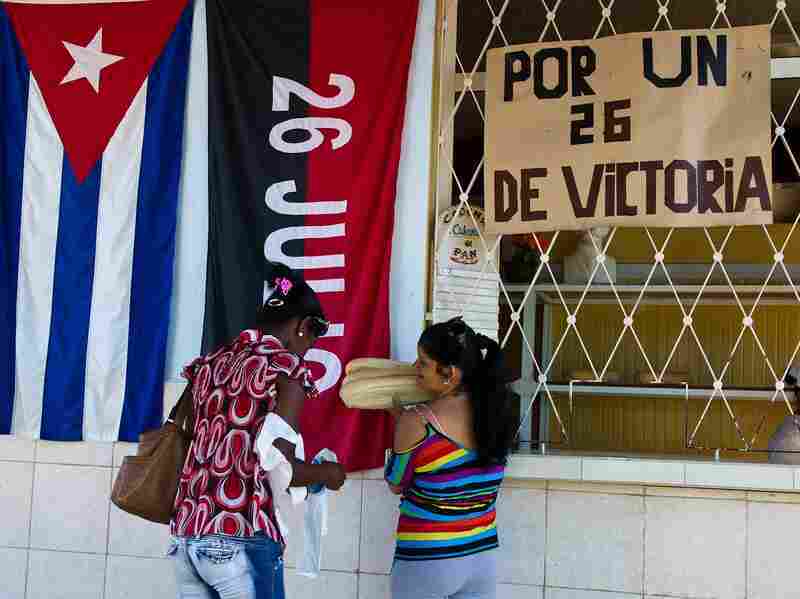 As tensions cool with the U.S., what does July 26 mean to Cubans today? 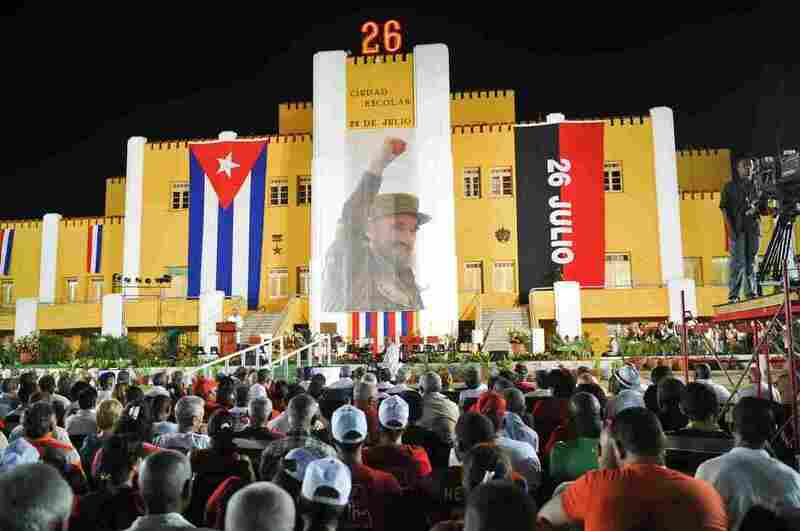 Cubans gather in Santiago de Cuba to celebrate this year's Revolution Day, the 62nd anniversary of Fidel Castro's first open assault on the forces of President Fulgencio Batista, who would eventually be overthrown by the rebels. On this day 62 years ago, Fidel Castro launched the attack that marked the start of the Cuban revolution. In the years since, the day has taken on emotional significance for the Cuban people — and for the communist government that celebrates it annually. This year, the Revolution Day celebrations fall smack in the midst of a remarkable week in U.S.-Cuban relations. After nearly 5 1/2 decades of enmity, the two countries formally re-established diplomatic ties on Monday, opening embassies in each other's capitals for the first time since 1961. And the festivities in Cuba reflected these seismic shifts. In a speech at a ceremony in Santiago de Cuba, Communist Party official José Ramón Machado Ventura touched on some of Cubans' burgeoning expectations. Michael Weissenstein, the Associated Press' Havana bureau chief, says Ventura addressed Cuban hopes for an end to the American trade embargo on Cuba, as well as the return of the military base at Guantanamo Bay. Despite the big speeches, Wiessenstein says, these days a number of Cubans just view the holiday as an ordinary Sunday. "It's a measure of how much Cubans are engaged with sort of everyday problems and not as much their revolutionary history, as they have been in the past, that you don't see ... flags hanging from the street," Wiessenstein says. "You don't see people celebrating or going to events." Still, the day continues to hold special resonance for many Cubans, as it has for decades. Dr. Andy Gomez, a retired academic who was a senior fellow in Cuban studies at the University of Miami, talks to NPR's Arun Rath about what July 26 means for many. 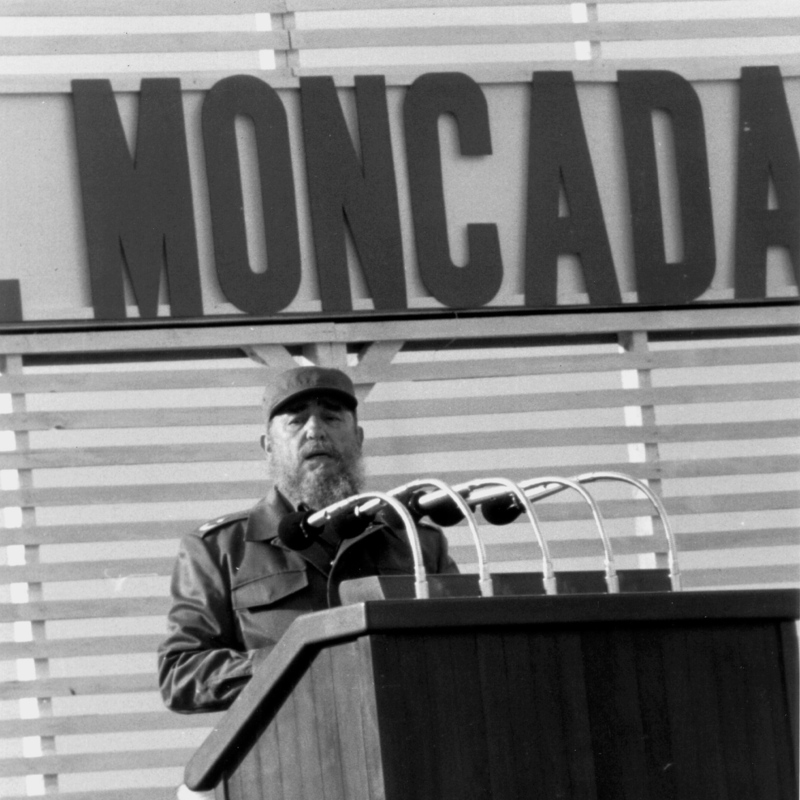 Fidel Castro delivers a speech in 1988, on what was then the 35th anniversary of his failed assault on the Moncada barracks. Sixty-two years ago — it seems like yesterday — a band of rebels led by Fidel Castro attack the [Moncada] military barracks in Santiago de Cuba, trying to begin to overthrow the government of Fulgencio Batista. They fail. Many of his colleagues were captured, executed at Moncada. Fidel, Raul [Castro] and a few others escape into the hills. And later, of course, they were sent to prison by President Batista. We have to understand that by then, many Cubans on the island were extremely upset [with] the dictatorship of Batista. ... There was a high level of corruption going on at the same time, and there were many groups trying to fight the Batista regime. Fidel was one of those groups — and the first one to literally take on Batista at a serious level. The symbolism, even with the failure, the symbolism — it represented the first serious attack or challenge to the Batista regime [to] begin to rally the Cuban people around Fidel Castro. Since then, the flag of the July 26 Movement, which became the Communist Party of Cuba, has been the symbol of the Cuban revolution. The flag is red and black with a 26 in the middle. Cuba's military wears an armband representing that July 26 flag. And I can tell you: In exile around this time of the year, we're very careful in Miami not to wear red and black. The flag of the July 26 Movement hangs to the right of the Cuban flag, behind two women buying bread in the city of Artemisa. For Cubans on the island, I think the symbolism has somehow — I wouldn't say been erased, but has started to surely disappear. The ideology of that July 26 Movement and later on, the Marxist ideology that Cuba embraced, has begun to — somehow, particularly among the young Cubans — be challenged and become a point of contradiction. Change has started in Cuba, as we all know. But change still doesn't have a very clear definition for the Cuban people. I think the July 26 day will continue to be marked down in history as a very special day in the history of Cuba. I do not think the history books can erase the purpose of the date, or even Fidel Castro and Raul Castro and the others that participated. How they're going to be celebrated once they're gone from the picture remains to be seen.